When I use Google search results to illustrate a discussion of usage, it is never my intention to suggest that the frequency of an error on the web is an argument for the acceptance of the error. Me and my friends slept late. are five billion errors committed by lazy and/or ignorant writers. Figurative expressions, however, are not in the same category as misspellings or grammatical errors. Figurative language originates in the imagination. Our imaginations are furnished with images that arise from the culture in which we live. When I hear the expression free rein, the image in my mind is that of a horse being given its head. Someone else, however, imagines a king who is able to do anything he wants to. The images differ, but the meaning of the expression remains the same. For the record, I’m not arguing for the acceptance of “free reign.” In my mind it will always be incorrect. Nevertheless, language changes. It changes regardless of a society’s educational system. In this period when English is not being being taught efficiently to native speakers, change is bound to be more rapid than in previous generations. If you haven’t looked at it yet, watch the ABC video clip mentioned in the free rein/free reign post. In it OED editor Ben Zimmer tells how OED researchers scanned a billion words from blogs, websites and other internet sources to arrive at the conclusion that “free reign” has become an acceptable variant of free rein. Nobody says we have to like it. Has correct English ever been taught well? We didn’t even have good English dictionaries until Johnson’s in the mid-1700s, and even then I bet only top notch writers used them. I’d argue that the rapidity of our changing language is due more to the internet than bad teaching. Not that bad teaching should be let off the hook. I’m just saying we’re no worse off now than we ever were in English class. @ Maeve, language drifts. I remember my English and Math teachers in Junior High (mid-1960s) gnashing their teeth about using “ain’t” in schoolwork. They claimed “ain’t” ain’t a word. Yet we started finding it listed in newer dictionaries. Dictionaries regularly add new listings for words used in new contexts, or contrived words that enter popular usage. “Popular usage” is a very subjective term. It might mean encountered in a scan through 10 respected scientific journals, or 10 issues of Weekly World News (eighth highest circulating paper in the world, and prominent in Mike Myer’s “So I Married An Axe Murder . . .”). Using the quick check of Google – which includes documents written for the web, documents imported from print life, and comments and chance communications found around the Internet – as one quick snap shop of “popular usage” seems quite reasonable. It has the advantage of being popularly available, easy for anyone to repeat the experiment, and is a reasonably respected resource. As you point out, a quick check is not the same as using the results as a reference – to anything but a snap shot of popular usage. I think proper English usage is often taught well. The problem is that not all teachers learned proper English. There are many people that treasure the richness and understanding of language used well. But not all find work in their cherished field. And not all tasked with teaching English see the responsibility as anything but an onus to get as many kids to pass the standardized tests as possible. Many teachers, math, English, history, etc. see their particular topic as one brick in a path onward. Rarely a teacher understands the richness and beauty of the topic, and is able to instill that appreciation in a class receptive to that underlying complexity. No teacher can prevail when the class has been hardened by neglect, or distracted by sports, crime, systematic bullying and other social influences of the school or neighborhood. Each class that misses learning at one grade, is less apt to appreciate the advanced material in later classes. We can rejoice that so many still understand and recognize proper English. That has always been a scholar’s purview. It seems I missed this post before. I did not mean to “take you to the task” the other day – I am sorry if it came across like that! Reading the replies here, now, I guess I am just the type of person that dislikes if a new spelling is added to a dictionary “just because the people have used/spelled the word wrong” – and that is why I react the way I do when presented with Google-numbers for certain types of spelling or usage. I guess I am more fond of dictionaries evolving along with the language if the changes are additions of new word creations, not necessarily a changed spelling. You know? We have, for example, new words in German, cooked up by writers or ad-writers, that are great and lovely (trying to think of an example, but of course now none comes to mind, grr). It is too bad that it takes sometimes a decade for such creative new words to finally find their way into our normative dictionary Duden. The same for nice colloquial expressions. I’m new to this site and I thank you for being out here. The article above shows that web usage DOES matter. If you write something incorrect and it ends up on the internet, there is the potential for hundreds of people (dare I say thousands or millions?) to also get the information incorrect and to send that incorrect information on to someone else in its incorrect state. And just because oodles of people get it incorrect doesn’t mean that it should be accepted and allowed to become correct. I think we forget that anything put on the internet (or even in email) has the potential to go viral. It is up to the writer to ensure that what they are sending is correct and to not assume it is correct (you know what they say when you assume…). 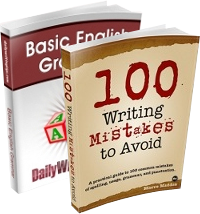 We should always double check what we are writing and even when we don’t have a doubt, make sure it’s correct anyway – especially slang and other forms of conversational speech and words that sound the same when they have different spellings (a different spelling usually means a different definition). We have to ask others to read what we’ve written – at least two proofreaders (by the way, is ‘proofers’ a real word?) if what we are writing is going to be published. And read your writing out loud to yourself – you’d be amazed at what you will catch when you read your writings out loud. Whenever I think of usage per writing on the web, I always recall the words “allot of.” This expression has 1.3 million Google hits. Even with 1.3 million occurrences, this is still wrong. However, as Maeve pointed out, this does indicate how people are using the language, right or wrong. I suspect that people are accustomed to hearing words used in certain ways or seeing them written in a particular manner. Then, when they are writing, they do what seems familiar, either because they aren’t paying attention or because they actually think the familiar way is the correct way. Perhaps the problem is not teachers, per se, but role models (roll models? ), which includes teachers. I can attest to numerous examples of teachers, from pre-school through graduate programs, who do not use English correctly. If parents use the language incorrectly, well, they can be forgiven to a degree. However, if teachers use it incorrectly, whether or not they are teaching English, they are harder to forgive. After all, the charge they accepted and the mission they promote is to help students learn. And this includes learning to communicate well. I was told in Junior High that the stated goal of compulsory education, when it started, was to establish a minimum base needed for a democracy style government to function – basic arithmetic, enough English to read and hear and understand speakers, and to understand the ballot. The onus to educate children has always been on the parents. For myself, Heinlein’s “Have Space Suit Will Travel” was an eye-opener at the beginning of the book. The kid’s Dad looked at his science books, and math, and provided what Dad considered useful level material – and made the kid learn both tracks. That was the first time I had considered that public education didn’t contain what a person needed, only what the Federal/school administration gestalt decided to *teach*. There is a fundamental difference. Schools are not temples of education, they are more like used education dealers, pushing whatever has piled up on their desk lately. The topics picked and the level taught are determined by who wants what taught, and only very seldom is the driving force what the kids need to know. We teach evolution or creationism or intelligent design – not based on what model is most useful to a young scholar, but on what wrangling has occurred between the contending Powers That Be. 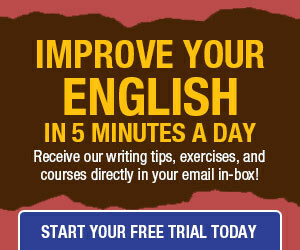 English is taught to whatever level the teacher happens to understand – as long as it meets the standardized tests. Seldom does anything get taught in greater depth than standardized tests require, or some driving political force imposes. Want your kid to learn? Teach her/him. I’ve taken several classes studying the evolution (and devolution) of the English language, and the fact is – we do not speak the same way we did 200 years ago, 300 years ago, etc. Language is always changing, morphing, moving. I had never known that ‘free rein’ was the “proper” spelling, because I have always used it in the context of “the freedom to do as one wished, as is a ruler.” Thanks for the clarification, but I choose to use the ‘reign’ version because (for me anyway) it makes more sense in context. Call it part of the ever-changing world of language. You’re right, we don’t have to like it, we just have to learn to live with it. Let me kick the bee hive here. One facet of this discussion that I think we’ve missed addressing is what I refer to as the “brown shoes” factor. By way of explanation, when in formal dress (like a tuxedo or tailored suit) a man’s shoes are supposed to be black — not brown, red, or glow-in-the-dark green. A man in a $5,000 designer suit looks sharp, but if he’s wearing brown shoes with that suit he comes across as a dolt who really doesn’t know what he’s doing (the lipstick on a pig expression comes to mind here). In writing, your reader gets their image of you from your words; you’re not standing in front of them for them to judge your appearance, nor at their elbow to explain something you’ve put on the paper. Consequently, your words and the way you present them will make or break how the reader perceives you and your abilities/talent. If you use correct language and spelling, choose your words well and use them to good effect, etc., you will come across as the man in the expensive suit. But if you use malaprops and misspell words and other errors you’ll be the guy in the expensive suit and brown shoes. Being a somewhat critical person I’ve seen in my own reading of other’s work how I judge a writer by their words. If I read a post by someone along the lines of “Dat man whut ons de sto tol me I caints has me no job dere” I immediately condemn that person’s entire post to the garbage pile. He’s obviously either a half-wit and a dullard, or has failed to stay awake during English class, or thinks so poorly of his message that he failed to take the trouble to express that message properly (and, by association, he’s indicating his lack of respect for me as his reader [customer]). Toss that drek in the rubbish and go read the work of someone who has enough brains to put his shoes on without giving himself an injury.